/ How do I copy music onto my Apple iPhone from iTunes? I’m stumped. With my iPod I simply drag and drop the music I want to take with me from my library onto the iPod on the left side of iTunes, but my Apple iPhone doesn’t allow me to do that. How the heck do I put songs on the iPhone without synchronizing my entire (massive) music library? As with much to do with the iPhone, there’s a bit of a trick to getting this working smoothly so you can have control over your iPhone music, while keeping it as darn easy to work with as possible. The answer? Create a custom playlist for your iPhone music library. Let me show you how to do it – it’s pretty darn easy. Notice here on the very bottom of the iTunes window it shows you how many songs are in the playlist, along with the size and total playing time. 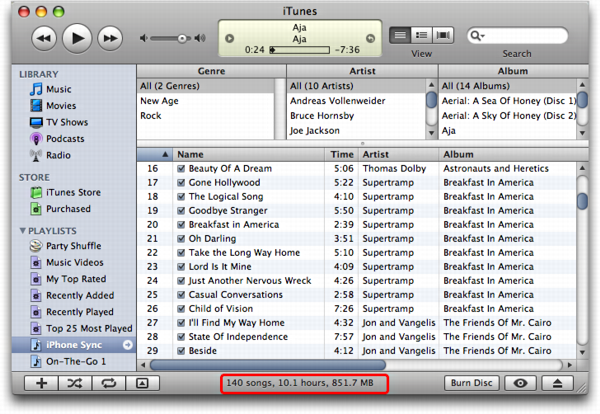 For my current playlist, it’s 140 songs, 10.1 hours, for a total file size of 851MB, no problem for my 4GB Apple iPhone. Set things up just as I have shown and that’s all there is to it. 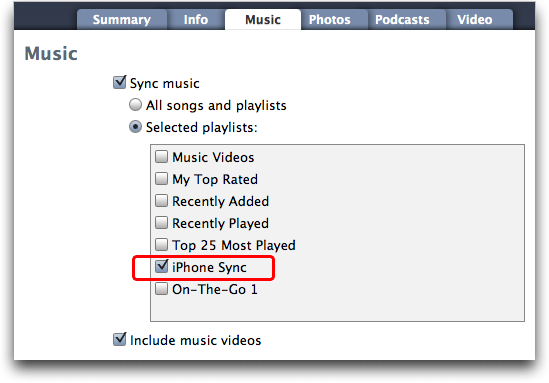 Now click “Sync” in iTunes and it’ll synchronize your playlist with the iPhone music library and next time you click on that ole’ “iPod” button on the iPhone, your selections from you music library will be present. Oh, and one really nice feature of creating this playlist is that you can manage it, adding and deleting songs to your heart’s desire, even without your iPhone present. Whatever changes you make are instantly applied to your iPhone music library the very next time you synchronize the device. Still learning about your iPhone? We have lots of iPhone help here on the site! And if you’re interested in finding a useful tool that can help you transfer music from your iPhone to your iTunes library and computer, you might also check out the Windows or Mac version of FonePaw iOS Transfer too. Your instruction on how to copy music from MacBook to iPhone has been most helpful. There is no need to download any application which can be dangerous as one can’t be very sure if such application is safe, or a just malware. Thank you so much. Just using whatever is available in iTunes itself as the Playlist is very ingenious way of avoiding synching iPhone with iTunes which can wipe out some of my songs and ringtones. Thank you very much Dave. I really need help. There some of my applications I didn’t like. I went to reset my iphone4s, everything was deleted and now the iPhone is indicating this accessory is not optimized for the iphone. I can’t even enter unside d phone or operate the phone, What should I do? The accessory not optimized for the phone is related to the tiny chip that’s supposed to be in the lightning connector for it to work right. Since it’s not, try flipping it over and plugging it in again (sometimes that works). If not, try a different cable! This process was very helpful to me and I appreciate so much. You know what, since I got this iPhone and needed music the most than any other things unless to I have been able to play musics on it through using your guide. It is different from the latest version of iTunes. Launch iTunes on your computer and plug into your iPhone to the PC. Click the “File” button and choose to add files or folder from your PC to iTunes library. Click the “Music” icon to sync the audio files. 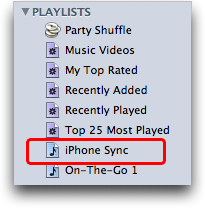 Check the “Sync Music” icon to decide to sync “Entire music library” or “Selected playlists, artists, albums, and genres”. If you want to copy the entire music library, check that option and it is done by clicking “Apply”. While you want to transmit only certain files, just choose the corresponding option and check the specific groups in the classifications below. After clicking “Apply”, the transfer begins.If you want to view the transferred files, click the “Music” button under “On My Device” in the left column. Hi! Actually I’m not using iTunes anymore. I prefer WALTR for copying music to iPhone. An amazing and simple app, uploads music in a matter of secomds with no need to convert or sync. I saw there were versions not only for Windows but for Mac as well. For me it works the best! I can see the option to choose “Selected playlists, artists, albums, and genres” under “Sync Music” but it is greyed out and I can’t do anything with it until I deal with the pop-up window which looks like it’s just going to replace everything. But there’s a running playlist on my phone that I don’t want replaced. Do you have a solution for this please? Hi, I am using iTunes Match but I’d like to be able to download music in bulk onto my iPhone, since I am in a foreign country and don’t want to use the expensive cellular network each time I want to hear an album on the go. Is there a way to do that? Since I’m thinking of downloading a lot of music in bulk, I want to avoid having to do it one album at a time using my fingers on the iPhone when I’m in a wifi setting. I use OS 10.10.3 and an up-to-date iPhone 6. Olivia, I don’t think there’s a way to accomplish what you’re talking about. I think you just need to be patient and download the albums over a period of time, or use iTunes directly next time your iPhone’s connected to your computer. That was really helpful; thank you! Thanks for helping me finally figure it out! However, this is something that should never have required an explanation (not your fault, obviously!). Putting music on your own phone shouldn’t be any harder than dragging and dropping a file onto a thumb drive. What the h*ll happened to Apple?!? Anyone who thinks Apple is still the “easy-to-use” choice hasn’t tried a different operating system since the late 90s. I used to be an Apple fan back in the day, but now I hope these incompetent greedy losers go out business, and the sooner the better. All you have to do is take the music from My Music, right click the song you want to put on your iphone, go down to add to playlist, and click on the name of your iphone! That simple. I hope this helped everyone! i had trouble with it my self. Thank you so much Hammond!! This really helped me. I’ve been trying to figure this out for ages! Which version of iTunes is this for? Doesn’t look anything like the newest version. Don’t see where I can sync playlists. You’re right, Dave, I need to update this article for iTunes 11. Thanks for the reminder! And now this apparently needs to be updated for iTunes 12? I can’t seem to copy my newly created playlist to my iPhone 6 Plus from iTunes 12.1.1.4 on a Windows 7 PC without erasing everything previously on that PC’s iTunes music lists through doing a Sync. Can you help, please? About a month ago I found this iStick and I’m still choosing between you guys and this new app called istick by softorino. Dave, you’re a freaking GENIUS! DO you know how frustrated I was becoming with this? I was thinking, ‘how can anything Apple possibly be this hard? !’ You made it really simple, thank you  BTW, I’m using a 5S and your instructions worked great. Dave, I was sure hoping your instructions would resolve my thorough frustration with iTunes but I am experiencing similar difficulties as others above; it just doesn’t work. I’m good thru the step of click on FILE, NEW and create a playlist. After that I am unable to drag anything into the playlist. I am on iTunes 11.1.5.5 and my iPhone 4 IOS is 7.1. That’s curious. You’re making and working on the playlist on your computer, though, right? Mac or PC? Or are you trying to do this on your iPhone? pfff just use iStick from Softorino…no iTunes sync, its super easy and they even got a free trial, check them out. Thanks Dave, it worked for my iPhone 4! what is shown above looks nothing like the current version of itunes. 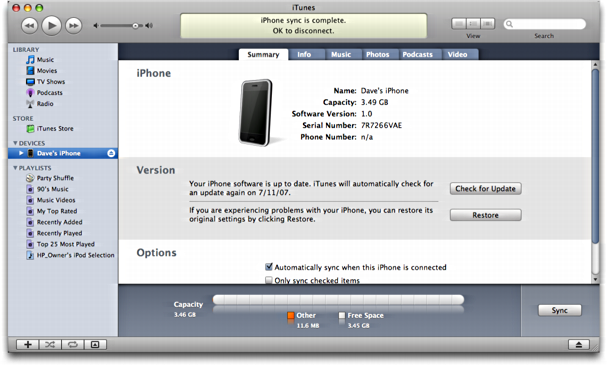 I cannot get music from my computer onto my iphone 4 using the above instructions, since itunes no longer functions as above. I have attempted time and time again to do what was suggested to no avail. These directions are apparently only able to be used if you are on your “home” computer, correct? I am synced to my computer at my house. Right now I am at my parent’s home. This cannot seem to be done without erasing my entire library and starting over.